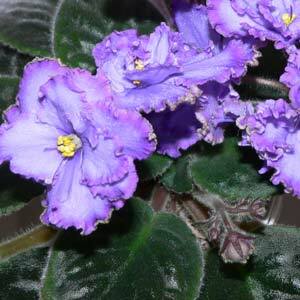 One of the most widely grown of all indoor plants, and readily available to buy online are the African Violets (Saintpaulia ionantha) and yes they were discovered in Africa, but have been highly hybridized for many years. Often seen as ‘old fashioned’ they are in fact very much in demand and are available for sale both online and at retail nurseries. With their origins in Tanzania and Kenya as well as nearby areas, they have been grown in Australia for many years. If you follow a few basic ideas on how care for them they will flower magnificently. Low growing, compact with attractive dark green, thick, hairy leaves and the violet-like flowers borne in small panicles just above the foliage, (see picture right) African Violets are readily available for sale as plants or leaf cuttings from online specialists. They prefer a constant warm to hot temperature and high humidity. African violets need plenty of filtered sunlight to thrive and should be planted in humus rich soil or special potting mix. The three most important care factors for African Violets are light, humidity, temperature and moisture, if you can control these your plants will be picture of health. Although they do not like direct sun they do need a strong filtered light to flower well. If you can give them around 8 hours of good light a day they will do well, if not bring in the artificial lighting like the commercial growers do, a fluorescent light will do the job. With proper lighting these wonderful plants will flower for many months. The natural climate was humid, so African Violets require humidity, a saucer of water beneath the pot is a great way to start, some pebbles in the saucer to lift the pot above the water will help keep the roots from getting to wet. A little spray bottle that can act as a misting spray will increase the humidity, but make sure its a fine spray and do not soak the plant. The ideal would be to have a temperature of around 25 C during the day. Most homes are a little less than this, but as long as they do not get to cold at night they should be OK. If you are using artificial light then the temperature will be raised by that, perfect. These plants are a little fussy, they do not like draughts especially cold ones. If you can use rain water, that’s what they were brought up on, no chlorine, no salts. Water should be a room temperature and remember to water the soil, not the foliage, that’s why people have those nifty little watering cans with a long skinny spout. 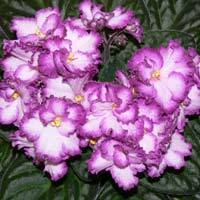 A wick watering system is ideal for African violets. Using a ‘wick’ watering method is also popular and yo can buy special wicking pots, or make one yourself. 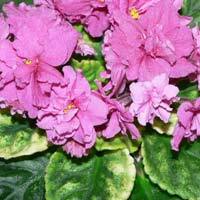 Fertilize 2 or 3 times a year using a specialist African Violet fertiliser. Propagation is not difficult and is carried out by many home growers. Propagation is carried out from both leaf and stem cuttings. Easy by removing a fully grown leaf with leaf stem attached. You can also use a ‘water and leaf suspension method’. Leaf Cutting Method of propagation. Use this method to propagate from leaf cuttings, look for a leaf that is fairly mature, but not old. Carefully cut the leaf from the plant using a sharp blade, take care to leave a stem around 2-3cm long as this is the part of the plant that will go into the propagation mix. Using a pencil, (or chopstick in our case) make a hole in the potting mix, this allows you to place the leaf stem in the the mix without damaging or bruising it. Firm the mix around the stem. The potting mix needs to be kept moist, new growth should appear in 8-12 weeks. As you have probably placed a number of leaf cuttings in the one pot, when the plants are growing well you can separate them into individual pots. Carefully remove and replant in individual pots. Take care with watering, water the soil not the foliage. Pinch out flowers heads for the first year to encourage growth. Take a leaf cutting with a stem at least 2 cm long. Suspend the leaf over water in a container with only the stem going into the water. You will need to refresh the water every 5 days. The stem should send out roots in around 21 – 30 days. Once good root growth is evident you can pot the cutting into a normal African Violet mix. Powdery Mildew – Remove any foliage or flowers that are affected. Make sure that you do not water the foliage. Mealy Bugs – These are small insects that look like small white furry spots, usually on the underside of the leaves. You can spray with Neem Oil spray, wipe them off with a rubbing alcohol swab or use one of the many sprays from garden centres. Spider Mites – Again use a Neem Oil spray or one of the many sprays from garden centres. Try not to ‘overpot’ any plant, it ends up providing the wrong environment and to mush water. Special African Violet pots are available for sale. These are ceramic or PVC, self watering pots that use a wick system. Some pot systems also use a ceramic pot with a PVC or plastic pot insert. BASS VALLEY AFRICAN VIOLETS 1493 Bass Highway Grantville 3984 Victoria – Phone 03 5678 8814 – email kennedy_violets@dcsi.net.au Over 200 varieties.We sell plants, potwells, potting mix and nutrient. ANNA-ROSE FOR AFRICAN VIOLETS 7 Henrietta St Towradgi,Wollongong NSW 2518 phone: 42845495 We sell a varieties, potting mix and other accessories. JANE’S AFRICAN VIOLETS 18 Homestead Drive Wauchope NSW 2446 – PH/Fax (02) 6585 2683 – email jpflood@iprimus.com.au Plants, leaves, potting mix, nutrient, pots, reservoirs. 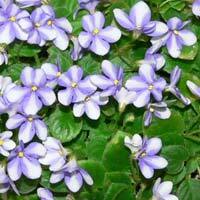 DIAMOND VALLEY VIOLETS Brennans Rd East Arthurs Creek VIC – PH (03) 97148439 – email dvviolets@iprimus.com.au 200 varieties , all growing requirements, nutrient, potting mix, water wells.